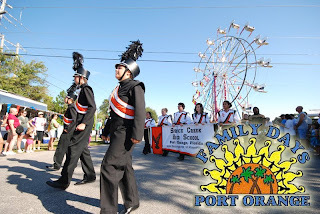 SPRUCE CREEK, FL - The City of Port Orange held its annual Family Days Festival this past weekend Oct 1st through 4th. From a City-sponsored festival and neighborhood block parties, Family Days in Port Orange has grown to become the premier volunteer-staged and directed community event on Florida's Fun Coast, annually drawing more than 60,000 residents and visitors for a four-day celebration of Community Spirit and Civic Pride. 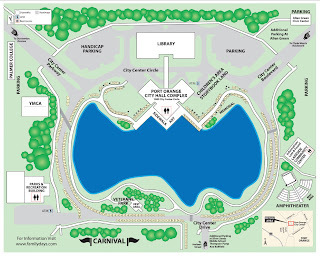 Family Days is celebrated around the lake and gardens at Port Orange City Center. Events included a family-oriented carnival and numerous entertainment venues featuring professional, amateur and student talents in many fields. 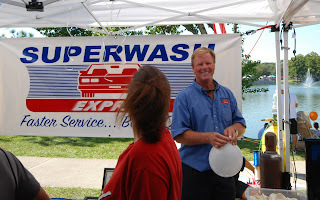 The Community Expo included hundreds of local vendors showcasing their businesses to the community, from SuperWash Express car wash (owned by Spruce Creek resident Paul Bradley)to insurance and pet stores, health fairs and the Fire Department. Food and refreshments were available to suit all tastes. Movies and music performances lit the night to the enjoyment of kids and adults alike. Jet ski rides and demonstrations by the local police were available at the City Center Lake. The Street Painting Festival is one of the public's favorites. Artists from the area and from all corners of Florida come to Port Orange and use the sidewalks as pallets for their art. With simple tools and chalk they create incredibly detailed paintings, from colorful parrots to clowns, abstract art and current affairs public figures. The quality of the artwork is fit for museum displays, see the photographs below that provide a permanent testament to the artists' skills and creativity. The Saturday Parade featured thousands of local children representing their schools, marching to the tune of their respective musical bands. Several local charitable organizations and sponsors joined in as well. 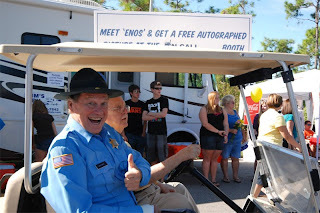 The parade also included an appearance by Sonny Shroyer, who played "Deputy Enos" in the popular TV show, The Dukes of Hazzard. On Sunday, the main event was at the Parker Amphitheater where the Navy Band Southeast’s contemporary entertainment ensemble appeared in a concert free to all. The ensemble remains on the cutting edge of today’s popular music scene by choosing a variety of selections each year from current Top 40 Charts. Their incredible mix of pop, rhythm and blues, classic rock, modern rock, dance Motown, soul, hip hop, swing, country and disco has won rave reviews and invitations for repeat appearances from audiences throughout the Southeast. Located only a few minutes from the Spruce Creek Fly-In, many of our residents took some time away from flying to attend the event.